The ideal solution for quick, easy and clean oil extraction. This oil extractor provides a neat solution to removing oil during an oil change. The extractor provides safe containment for 6 litres of oil and provides a hassle free solution to what can be an extremely messy job! The oil extractor is made of two parts, the container and the pump. The pump sits on top of the container with a tight seal and can usually activate the powerful vacuum suction required to pull the oil out in just 10 to 20 strokes. 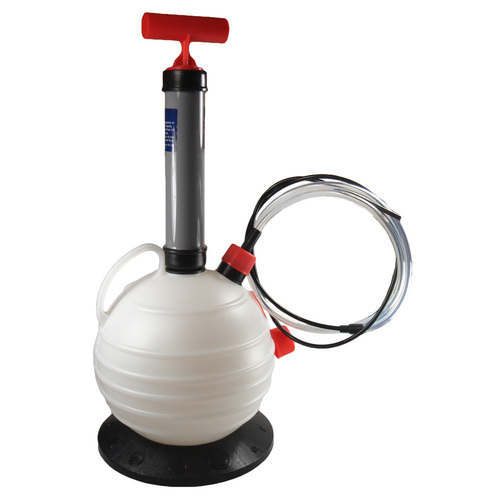 The detachable pump also provides the benefit of compact storage. A very stable base provides excellent support to the oil container even when full so oil spills should be minimised.